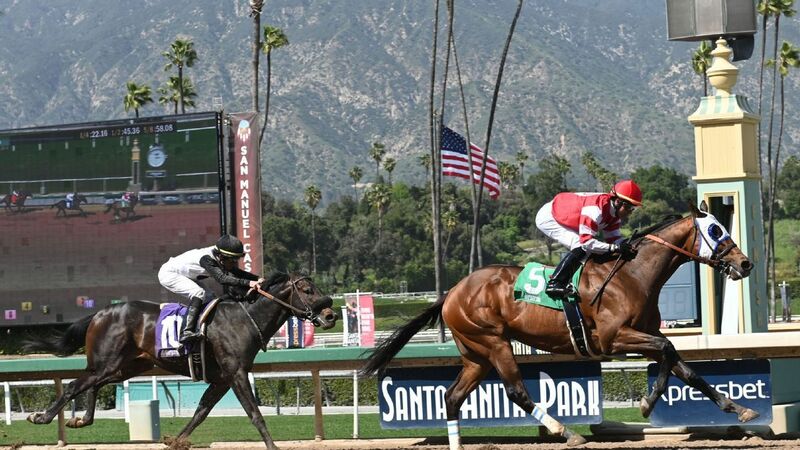 Santa Anita will continue racing through the end of the current meet on June 23, despite objections from animal rights activists who urged the California Horse Racing Board to shutter the historic track. All three sites of the Triple Crown are among several major tracks that have agreed to phase out the use of a common anti-bleeding medication starting next year. There were no positive tests in the first two weeks of horse racing at Santa Anita under new rules limiting race-day medication, it was announced Wednesday at a meeting of the racing board's medication, safety and welfare committee. Los Angeles County District Attorney Jackie Lacey has formed a task force to investigate the nearly two dozen horse deaths at Santa Anita Park between December and March. Trainer Danny Gargan prepares TAX for the 145th Kentucky Derby. Plus, mainland China runs its first competitive thoroughbred meet. Omaha Beach held off Improbable to win the Grade 1 Arkansas Derby on Saturday, moving into second place on the Kentucky Derby leaderboard. Omaha Beach earned his second consecutive graded stakes victory and third overall in four starts in 2019. The northern grandstand at Pimlico Race Course has significantly deteriorated and will be closed for the Preakness in May. Go along for the ride as Bob Baffert's latest top trainee endures anxious, rain-soaked weeks to do what he loves most: run. Back-to-back Grand National winner Tiger Roll is a doubt for next year's race according to owner Michael O'Leary, who wishes to protect the horse's health. Jon Court, 58, rides Rebel co-winner Long Range Toddy in the Arkansas Derby. Plus, an informative, nuanced view of the situation at Santa Anita. Roadster defeated Game Winner by a half-length at the Santa Anita Derby on Saturday, giving trainer Bob Baffert a 1-2 finish. Roadster needed to finish first or second to earn enough qualifying points to make the Kentucky Derby field. Favored Vekoma's third win in four career starts was good for 100 points toward next month's Kentucky Derby. Tacitus earned 100 qualifying points for the Kentucky Derby with Saturday's Wood Memorial win at Aqueduct. Tacitus has won three of four career starts. Tiger Roll has become the first horse to win back-to-back Grand Nationals since the legendary Red Rum after storming to victory at Aintree racecourse. Signalman prepares for the Blue Grass Stakes, plus a comprehensive look ahead to the Santa Anita Derby, Wood Memorial and Blue Grass -- and a rundown of top Kentucky Derby contenders. Arms Runner became the 23rd horse to die at Santa Anita since the start of racing season on Dec. 26 after he fell on the dirt crossover portion of the track on Sunday. Maximum Security earned a berth in the Kentucky Derby on Saturday with a wire-to-wire victory in the Florida Derby. Maximum Security is unbeaten in four career starts. Plus Que Parfait went to the lead in the stretch and won the $2.5 million UAE Derby on Saturday. Racing is underway at Santa Anita for the first time since it was stopped nearly a month ago following the deaths of 22 horses.